A family-owned negotiation training and coaching company used intelligent inbound marketing to captivate its audience and increase lead volume. Founded by former FBI hostage negotiator Chris Voss, The Black Swan Group emphasizes techniques that are rooted in emotional intelligence. It teaches applicable skills—not theory—for resolving negotiations through training for teams, one-on-one coaching, and keynote presentations. 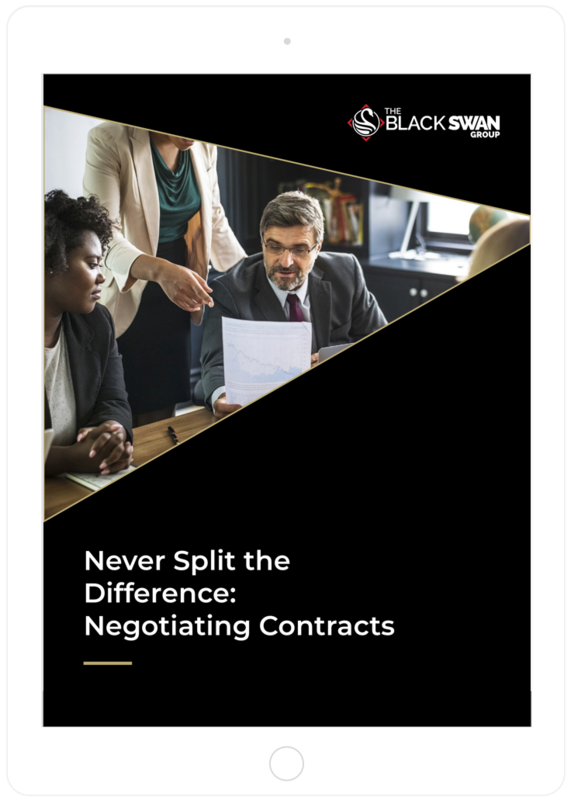 Because The Black Swan Group is making connections through training and keynotes, the company has an engaged audience of clients and prospects and a well-built contact list. 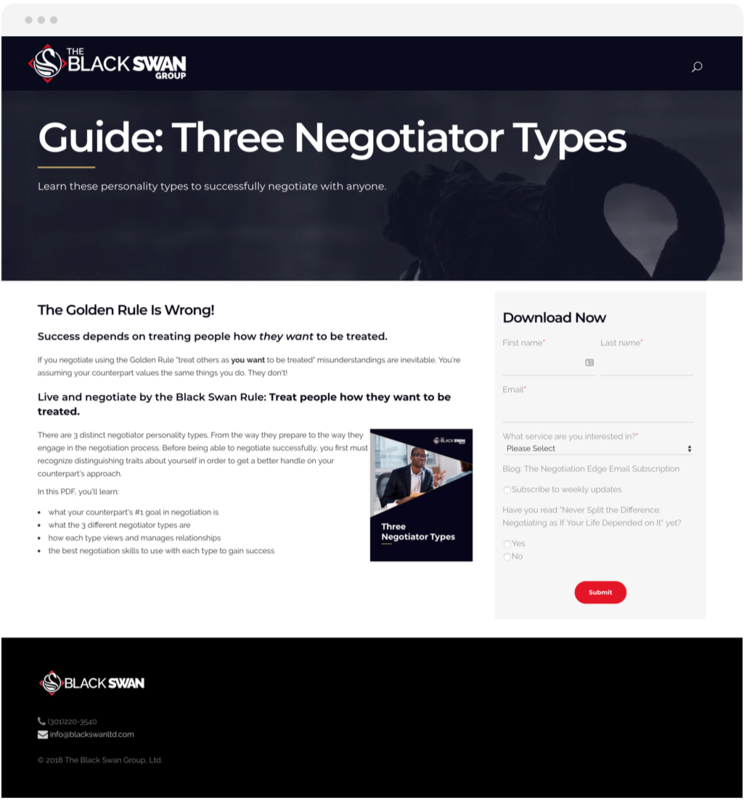 Prior to bringing SmartBug in as an extension of its small but mighty marketing team, The Black Swan Group created two downloadable content pieces and had a regular blogging schedule internally. These blogs were used in a newsletter to supplement the email marketing campaigns centered on the team’s event calendar. With Maya as its one-woman marketing department supporting its growing brand, The Black Swan Group knew it needed to expand its team for more marketing bandwidth. The Black Swan Group set goals for growing its subscriber list, improving open rates for emails, and creating additional content offers to bring in more leads. Meeting the company’s goals for engagement and lead generation was challenging. As an extension of The Black Swan Group’s marketing team, SmartBug proposed a more aggressive content creation program for blogging and conversion offers and updated website and content designs to improve conversion rates and reinforce the brand people see at seminars and training. With its growing contact list from events, it was also imperative that The Black Swan Group continued engaging contacts and providing additional resources and conversion opportunities to set the stage for lead qualification and nurturing. "We needed to support The Black Swan Group’s business model, that before SmartBug was very human to human, with inbound marketing and more digital content to continue the relationship after that first in-person touch"
We created a plan to roll out unique strategies for branding, conversion rate optimization, and content creation to continue growing The Black Swan Group’s community. In the past nine months, our team has truly integrated with The Black Swan Group’s team and dug in to determine how we can continue to captivate its audience and provide value. This thoughtful content strategy has continued to shatter records—proving this inbound marketing plan is unquestionably resonating with The Black Swan Group’s target market. 22,000+ page views on a single blog post in one month. This staggering volume in traffic is an amazing testament to the power of understanding your personas and supporting content creation with keyword research. 51.71% open rate and 28.97% click rate on blog subscription emails. For reference, industry standards for consulting companies like The Black Swan Group include a 19.34% open rate and a 2.28% click rate for emails. 407.89% increase in organic traffic year over year. This level of organic growth takes time. After nine months of blogging with strategic SEO efforts, The Black Swan Group website is reaping the benefits, with future months trending toward continued growth. 11.21% conversion rate from organic traffic resulting in 3,616 new contacts. Conversion rate optimization has contributed to an increase in leads in tandem with the growth in traffic for a higher volume of leads. With a strong foundation for content creation that is sustainable and will keep running and keep growing, the next phase shifts to setting new goals on qualifying leads and closing those into sales. We are currently developing a strategy for increasing attendance at The Black Swan Group’s 13 live events this year using the company’s now segmented database. Using HubSpot as our marketing automation, lead qualification, and content tracking tool, we can determine which leads are the best fit for these events and create personalized campaigns to continue to re-engage them.